Happy New Year! As you will have probably noticed by now, we commence 2015 with a magazine dedicated to international dance, with a particular focus on training. Gerald Dowler talks to Christopher Powney, the new director of London’s Royal Ballet School, about his ambitions and plans for the future of the school, and Richard Glasstone marks the 50th birthday of the Spanish Dance Society by highlighting its origins in South Africa. I travel to China to participate in the Beijing Dance Academy’s 60th anniversary celebrations, and Zoë Anderson talks both to Aakash Odedra about his training in Indian kathak and Bharata Natyam, and to British dancers Gregory Dean and Kizzy Matiakis about dancing ballet the Danish way. 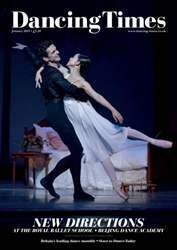 In addition, Igor Stupnikov and Jack Anderson offer their regular columns from St Petersburg and New York, and we include reviews of ballet and dance from the UK, Australia, Belgium, Germany and the US. You can also read Barbara Newman’s views on two musicals that have just opened in London’s West End and, finally, there is a round-up of just some of the latest dance books and DVDs that have recently been made available. We hope you enjoy it!